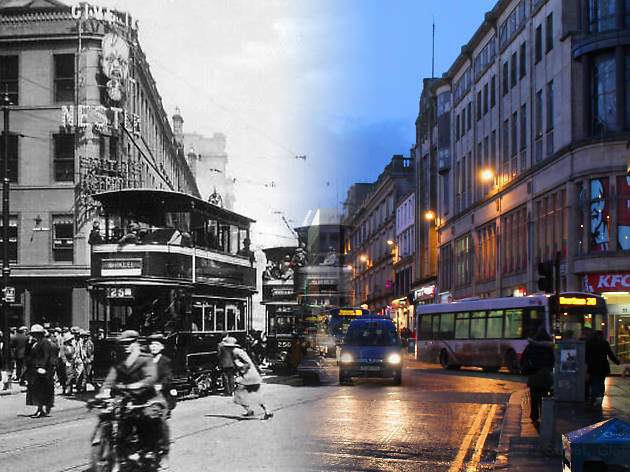 These incredible photos juxtaposing images of Glasgow old and new surfaced online recently via OnThisSpot, the travel/history/photography blog of Canadian backpacker Andrew Farris. Farris has been passionate about history from the age of 12, when he attempted to write a technical manual on WWII tanks; later, having discovered that his hometown in Western Canada is 'a corner of the world without a long written history I could explore', he set out across the globe to explore 'the places where history happened, [to] see how time has treated them and see if I can think of anything interesting to say about them'. Among his list of destinations was Glasgow, a place which also held some sentimental value for Farris: 'it was the city my mother was born in before she and her young family emigrated to Canada in the 1950s'. In addition to his striking photography, Harris's blog also contains mini-essays, providing the reader with some context to the images both old and new. He's also blessed with a talent for wry understatements, remarking that the grand Victorian Gothic Christian Institute on Bothwell Street has been replaced with 'the rather handsome modern office block we see today'. You can see more of Farris's Glasgow photography, as well as snaps from other locations around the world, on his blog, and follow his updates on Facebook and Twitter.